WASHINGTON, D.C. – From their first days touching a basketball, players are told to dribble with their heads up, allowing their eyes to survey their surroundings. In the NBA, where the next game approaches on the heels of the one before, that’s a vital principle rely upon in the macro sense as well. After scratching and clawing for the fourth-largest comeback in Thunder history to erase a 19-point third quarter deficit and defeat the Charlotte Hornets, Head Coach Billy Donovan’s club raced to the nation’s capital to square off with the Washington Wizards. Despite the quick turnaround on an Eastern Conference back to back, the Thunder is aware of what and who it is up against. “We lock into what’s going on around the league,” forward Paul George stated. From its own experiences and from scouting, the Thunder knows that despite the Wizards 1-6 record to start the season, that this is an extremely talented group in Washington. With John Wall (20.9 points) and Bradley Beal (22.6 points), Wizards coach and former Thunder head man Scott Brooks has a pair of extraordinarily talented guards in the back court. Wings Kelly Oubre (38.9 percent from 3) and Markieff Morris (44.4 percent from 3) have both been lights out from the three-point line, and tonight the Wizards will get Dwight Howard into the lineup for the first time this season. In its preparation, the Thunder understands that despite holding its opponents to just 33.5 percent three-point shooting on only 27.7 attempts per game, there’s still room to improve. Donovan evaluates his team’s defense on how contested the shot was, not simply on whether the ball went in. 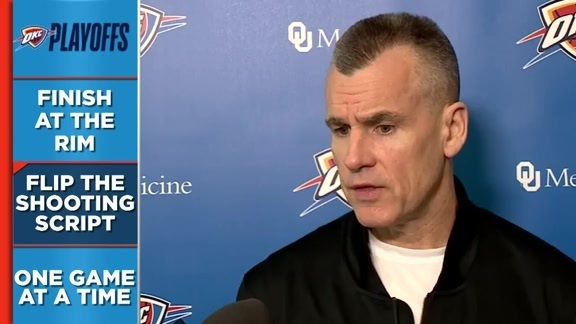 Fortunately for the Thunder, however, the team is built to withstand all different types of stress tests, be it at the three-point line or down in the paint. Against the Wizards tonight centers Steven Adams and Nerlens Noel’s presence will be critical to maintaining the team’s job on the glass, where it must continue to work to grab more than its current 76 percent of defensive rebounds. Yet if the situation calls for it, Donovan knows he can go with a smaller lineup, as he did on Thursday night in Charlottee with Jerami Grant at the center spot, surrounded by a full crew of guards and wings. “That’s the luxury we have with so many versatile guys, we can throw pretty much any lineup out there and make something happen out of it,” said George. On the second night of a back to back, the Thunder is going to have to do more than just rely on the talent and versatility that Donovan can conjure. It will have to create its own energy, and right from the outset. In the first half and to start the third quarter against the Hornets, the Thunder couldn’t quite find that next gear. It was only when down 19 and with the boost of Donovan’s rotation change that the team made a gear shift. When playing on legs that battled the night before and against a squad like Washington who hasn’t played since Tuesday, the Thunder will have to be its own engine. “We gotta realize that we cannot rely on that for the rest of the season,” said guard Alex Abrines of the late game heroics. One way that this Thunder squad can do that is by playing to its identity right from the outset. The reason that the small ball group worked in Charlotte was because of the speed and tempo it encouraged. With Russell Westbrook, Dennis Schröder and Paul George as primary ballhandlers, the Thunder and explode out into the open floor with the best of them. If it can do that for long stretches of the 48 minutes tonight, the Thunder (3-4) will give itself a chance to get back to .500 before coming back to Oklahoma City. A closer look at an electric team performance. - The head of the attack for the Thunder is Westbrook, and the way he plays clearly determines quite a bit about how the group goes. Last night against Charlotte, Westbrook racked up 17 points, 8 assists and 3 steals in the second half, compared to just 1 turnover. In the fourth quarter, Westbrook shot 6-of-7 from the field, with 3 assists and 0 giveaways. It was masterful, emphatic stuff from the 2017 MVP as, incredibly, he led the Thunder to 17-of-22 shooting in the paint in the 2nd half. “He’s just the straight toughest dude out there,” said George. 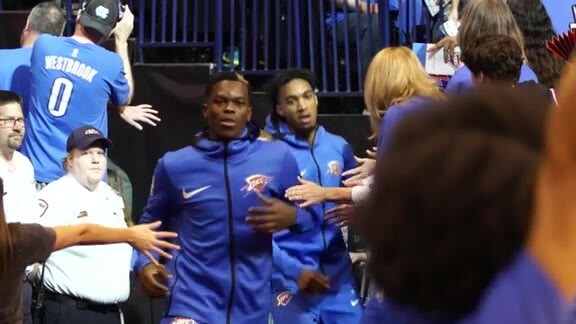 - The revelation for the Thunder on Thursday was Abrines, whose career-high 25 points off the bench were life-giving to Donovan’s club, which was on the ropes before the Spaniard’s eruption. By sprinting out into transition, Abrines got himself into position early on the wing, and then surprised the defense by cutting to the basket in fast break situations as well. His biggest shot of the night came on a baseline out of bounds curling jumper, which concluded his 9-for-15 shooting night. Abrines is now averaging 7.7 points on 36.4 percent three-point shooting this season. You can't miss a game if the schedule is your background.